Allstate, also known as the Allstate Corporation, is best known as the nation’s largest public personal insurance company. They currently serve over 16 million households across the United States and Canada. This insurance company is considered one of the better choices for insurance, especially since Allstate was rated as one of the industry’s best insurance companies at one point. Since they provide insurance to millions of people across the country, they’re also considered the second largest personal insurance provider in the United States. To further promote that, they also have several local offices located throughout the country. Allstate currently provides several different types of personal insurance, including the popular home insurance, auto insurance and life insurance. They also offer various financial products besides their various insurance policies. Allstate was initially founded in 1931, after Sears, Roebuck & Co. first held a national contest that eventually decided a name for their new brand of car tires. Allstate was the name that was selected from the contest, out of over two million submissions. Allstate tires were so successful that Sears Chairman General Robert E. Wood praised the tires and their contribution to Sears’ retail success. Though, the insurance company idea didn’t arrive until 1930. That would happen when a neighbor of Wood proposed that Allstate start selling auto insurance by direct mail. Allstate Corporation is currently based out of Northfield Township in Illinois, where they continue to be the largest leading insurer of many urban areas across the United States. Allstate’s advertising campaigns are presented across many media formats, including television, radio, print media, outdoors and on the Internet. Their famous slogan, ‘You’re in good hands,’ is usually seen in these advertisements. They also use the slogan, ‘Are you in good hands,’ on occasion. Their slogan was first created in the 1950s by Allstate’s sale executive of the time, Davis W. Ellis. The catchphrase was first used by a doctor who was taking care of his sick child; later in the year, Ellis recalled the slogan during a brainstorming session with Allstate’s marketing team. They were to come up with the slogan that would be used in the company’s first national advertising campaign. Ellis provided the slogan before they finished the session for the day, which was later used in all advertisement campaigns going forward. Throughout the 1960s and the 1970s, the slogan ‘You’re in good hands’ became instantly recognizable to many people across the country. It’s also now ranked as one of the most recognizable marketing slogans in the United States. By 2001, Allstate changed their famous slogan to ‘The right hands make all the difference.’ That slogan accompanied by an advertising campaign that featured hands of people who were able to make a difference in the world due to their unique talents and abilities. 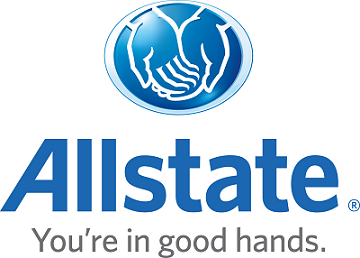 Though, into the 2000s and the current decade, Allstate has continued to use their most recognizable slogan, ‘You’re in good hands.’ Probably a current example of their logo’s use is in their 2010 advertisement campaign, ‘Mayhem,’ where narrator Dean Winters followed pitfalls that commonly affected both drivers and homeowners. As for the logo, Allstate’s current logo is typically depicted with white or blue letters bearing ‘Allstate,’ with a globe above or beside it. The globe commonly depicts two hands cupped together in a ‘giving’ gesture, in either blue or white. Much of the same Allstate logo has appeared on all of their advertisements since its founding in the 1930s. As mentioned, Allstate was first founded in 1931, as a part of Sears, Roebuck & Co. that was rather different in the beginning than some people would expect. The company was initially founded with a name that was based on a tire brand, eventually turning into an auto insurance company after a certain event. That event occurred during a bridge game that took place on a commuter train sometime in 1930. On that train ride, insurance broker Carl L. Odell pitched an idea to Robert E. Wood about having them sell auto insurance by direct mail under the Allstate brand. Wood liked the idea and eventually took that idea to the Sears board of directors. After their approval, the Allstate Insurance Company went into the business of offering auto insurance via direct mail and through the Sears catalog by April 1931. By 1934, Allstate began expanding throughout the state of Illinois, first starting by opening their first permanent sales office in a Chicago-based Sears store. By 1949, the construction of the first Allstate Headquarters Building was completed; the company, however, later relocated in the following post-war years. The year 1950 saw the creation of the company’s famous slogan, ‘You’re in good hands with Allstate.’ By the end of the decade, the slogan was frequently used in the company’s first network advertising campaign. Throughout the 1950s, Allstate started adding more insurance products to their already diverse line of products, including fire insurance (in 1954), life insurance and homeowners insurance (1957). They did, however, start selling insurance in Canada by 1953. Eventually, their Canadian division, the Allstate Insurance Company of Canada, was incorporated by 1964. In 1967, their headquarters finally moved to Northbrook, Illinois. Since that move, they continued to add on more types of insurance to their already available product line. That included worker’s compensation insurance (1964), surety bonds (1966), inland marine coverage (1967) and a policy package for businesses (1969). Throughout the following decades, Allstate continued to offer their insurance packages to customers, though by the 1980s, Allstate started to move their agents out of Sears stores and into independent neighborhood offices. By 1993, about 20 percent of their company became public; by 1995, their company became independent after Sears spun off the remaining 80 percent Allstate company stake to their shareholders. Since becoming independent, Allstate rose to become of the top insurance providers within the country. Allstate currently sells various insurance products, which cover a wide variety of insurance related needs. Their various insurance products are sold through their exclusive Allstate agents, who are contracted to Allstate to exclusively sell insurance products under their label. People can purchase Allstate insurance products via various sales and service centers affiliated with Allstate, in addition to Allstate’s official website. Due to the conditions of their policies, they’re one of the most commonly recommended insurance providers within the United States. Allstate also provides a comprehensive database of information about their insurance products on their website, mainly for people who want to learn more about Allstate insurance. Allstate’s various insurance products include both asset protection and wealth transfer insurance products. Their line of asset protection insurance products auto insurance, homeowners insurance, condominium insurance, renter’s insurance, commercial auto insurance, business umbrella insurance, motorcycle insurance, mobile home insurance and various other insurance policies. Their wealth transfer insurance policies include estate planning insurance products, business succession planning products, long term care and supplemental health products, universal life insurance, term life insurance, variable life insurance and more. Allstate also sells various insurance products through the Encompass and Esurance brand. The Encompass brand are usually sold in the form of a package policy for both homeowners and auto insurance policies. People can buy Esurance brand insurance products via the official website and at various select insurance agents, in addition to call centers.